What makes Incentive Solutions group travel rewards different from your typical travel incentive program? We pair our incentive technology with our incentive travel services to provide more than “just” a travel incentive program. Contact us about our incentive travel programs today. Incentive Solutions has put together an fantastic team, and everyone works together to provide outstanding service. This is a program that we spend almost no time in managing, and our customers really appreciate the loyalty program. So, are you ready to take your travel incentive plan up a level with our event planning and technology services? Whether you're looking to bump up customer loyalty or increase sales, our travel incentive programs make it easy to develop, market and manage incentive travel. Pre-built promotional campaigns create room to focus on a travel incentive plan that works. And engaging incentive software keeps travelers minds' on the big incentive trip ahead. It’s all smooth sailing with the incentive travel and event planning services we offer. These aren’t your grandfather’s corporate travel incentives – they are marketing command centers. 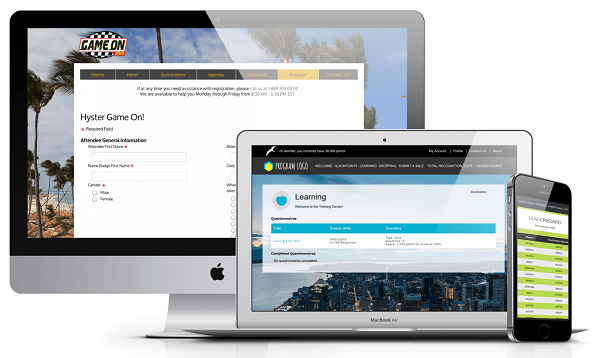 Make qualifying for your incentive trip fun and educational with online product training. Tell me more! Add your travel rewards portal to your site navigation and drive up program participation. Tell me more! Your travel rewards program can be available whenever participants reach for their phone. Tell me more! Motivate performers to earn a spot on your corporate incentive travel trip with this automated leaderboard. Tell me more! We help you develop incentive trip themes, promotional materials and marketing communications that align with your goals and brand image. Ready to get your debit card rewards program started?